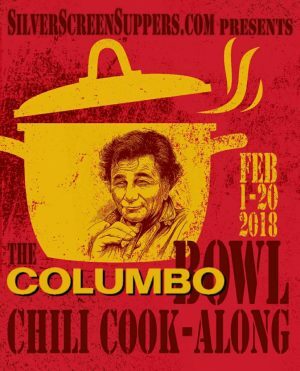 I do love a virtual party (to be clear, I also like real parties with real people, in the same room as me), so I was very excited to join Jenny’s Columbo Chili Cookalong and rustle up bowl of Johnny Cash’s Chili. 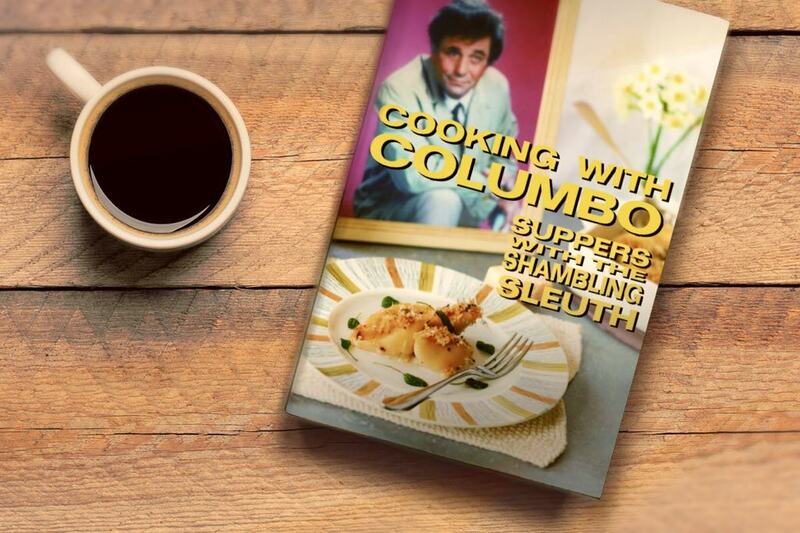 I was there at the highly entertaining launch of Jenny’s book, Cooking with Columbo, and I suggest you all go and buy it. She sold out on the night so I’m awaiting my very own copy, but I did get one for my sister-in-law’s birthday and kept it to be bestowed upon her on the appropriate date. Really glad I did, as it means I’ve had a chance to flick through it (sorry Nicky). Well done to my amazing chum Jenny – what a fantastic achievement. Your incredible hard work was well worth it. 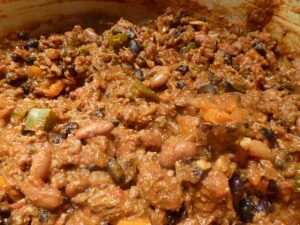 I would say it’s hard to beat James Garner’s Oklahoma Chilli – I think I’m allowed to say that on this blog – Jenny herself said it was “without a doubt the best chilli ever”. I wonder if Johnny has taken over James’ place in Jenny heart chilli-wise?? Anyhoo – I chose beef rather than venison or squirrel, just because it was easier to get hold of. I tweaked the recipe a bit: I don’t much care for the green pepper, so only used half a one of those. I added an orange pepper as they looked so lovely in the greengrocers. I know, throwing caution to the wind! I did chuck in a few slices of jalapeño pepper but I couldn’t find a habanero pepper for love nor money. Now, I don’t know if this makes me unusual, but I don’t actually have a favourite brand of chilli seasoning mix, as called for by the recipe, so just went for what Ocado had to offer, which was Old El Paso. I was a bit alarmed at the prospect of 32g of chilli powder and stopped weighing when I got to 20g. That seemed like quite enough. It was only once I started cooking that I realised the sage and oregano were probably meant to be dried. I used the fresh sage, because we don’t like waste, do we? But I recalled from a recent herb and spice cupboard audit that I had a jar of a dried herb that might well be oregano – I bought it in Italy and was sure I’d remember what it was so didn’t label it. So maybe I used oregano, maybe I didn’t. I used black beans and pinto beans, but I withheld the kidney beans – the pan was nearly overflowing! I asked Jenny what kind of beer to use and she recommended Hammerton beer from the family brewery but I couldn’t get any, so I used Windrush Stout from the Brixton Brewery, as recommended by the lovely folk at Prohibition Wines down the road. I did as Jenny suggested and made a batch of self-rising cornmeal – what the hell am I meant to do with the rest of it?? I found lots of recipes for making it but none for using it apart from this one. Serves 6 – really? More like 20 I’d say, unless you happen to have had a group of very hungry cowboys over for dinner. Which I didn’t. 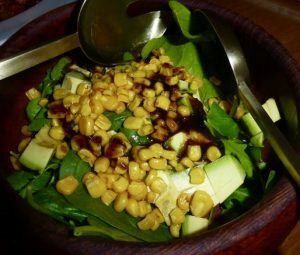 As readers of Dames Who Dine will know, I don’t love rice, so I served the chilli with lashings of sour cream and chives, some crusty bread and a green salad with avocado and some toasted corn and a balsamic dressing, which seemed about right. I thoroughly recommend this chilli – it was flavoursome, packing exactly the right amount of punch. Don’t be put off by the lengthy list of ingredients – it’s pretty straightforward to make. I too couldn’t get a habanero chili – but they are pretty hot I think. The last version of the chili I made seemed the perfect heat, so I’m gonna write that up for next time I make it. And yes, serves about 20 is probably right. Freezers all around the world are heaving with leftovers! This was HALF Johnny’s recipe. Who in jolly old England would have a pot big enough for the full monty? Has Johnny’s chili stolen my heart from James Garner. It is a CLOSE CALL! Chilli seasoning mix? Hmmm… I can highly recommend making your own harissa. There are many recipes out there, and it is very easy to make. Top tip – Make more than you need and freeze it using an ice cube tray. One cube at a time will be sufficient for most purposes – unless of course you do have 20 peopke coming round. And a top tip to go with the top tip – Use an ice cube tray that you only use for this purpose, unless you want a shock with your next gin and tinic. It was a powdered mix, although I see no reason why you couldn’t use harissa. I love the idea of an ice tray full of spicy sauce 🙂 I forgot to write on the blog that Jenny and I had a lengthy conversation about whether it was possible to make a chilli and pepper free version of this, so I could make it when Uncool P, with his allergy to such foodstuffs, was here. We concluded that Johnny C would probably chuck me straight into Folsom Prison if I did any such thing! Green pepper dislikers of the world unite!!!! I have it straight from the source that Nigella Lawson also does not like them so we are in good company!